According to the Organization for Economic Cooperation and Development (OEDC), in 2011 total healthcare spending in the United States was $2.7 trillion. 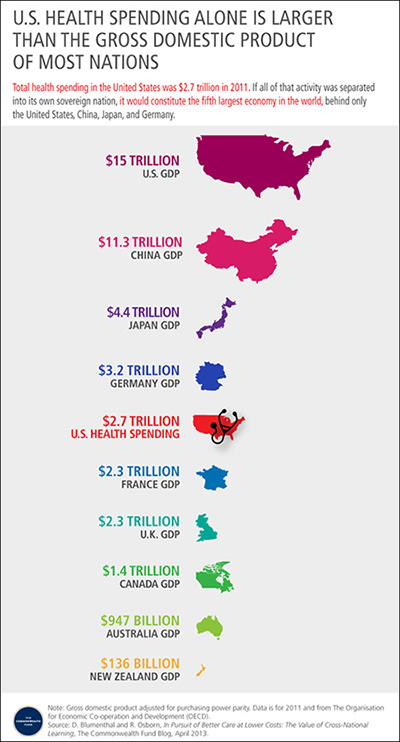 In terms of Gross Domestic Product (GDP), that figure would represent the fifth largest economy in the world, behind only the U.S., China, Japan and Germany. These enormous healthcare expenditures are commonly attributed to an aging population and technological advances. However, operational inefficiencies are cost drivers that are often opaque and contribute significantly to increasing costs. Lean Six Sigma, when applied to the healthcare environment, is an effective way to strike the delicate balance between delivering high-quality care and cost effectiveness. Using Lean techniques to address cycle times (efficiency), and Six Sigma techniques to address defects (effectiveness), Circle 6 has been able to help our clients achieve millions of dollars in hard savings and improve the quality of patient experiences and outcomes.